Preheat the oven according to the sugar cookie dough directions. Line a baking sheet with parchment paper or nonstick aluminum foil. Using a medium cookie scoop, scoop out balls of sugar cookie dough and arrange them on the baking sheet leaving 2-inches between them. You'll need to do several batches. Bake for 12-14 minutes, until golden at the edges and cooked through. Let sit for 5 minutes, then transfer to a wire rack to cool completely. Stir together the clementine juice and confectioners sugar until just combined. Add the clementine zest. Whisk rapidly until smooth. Drizzle the clementine glaze over the cooled sugar cookies and let dry completely (1 hour or so). Raise your hand if your favorite Christmas treat falls in the cookie category. Me too! Making dozens of different cookies is part of the fun of the holiday season for my kids and me. We bake and bake and bake until we have so many cookies that we have no idea what we’ll do with them. Then we bake a few more. This year I am busier than usual, so simple is the name of the game. Three ingredient cookies? That’s just about my speed. 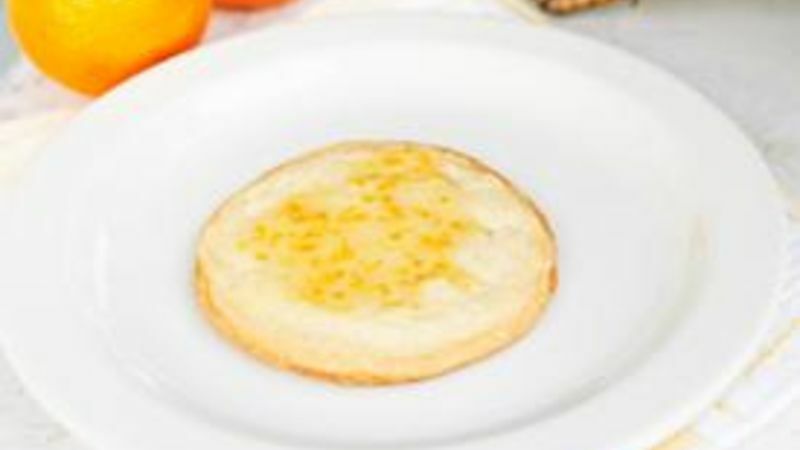 Sugar Cookies with Clementine Glaze are so simple to make – seriously, they have only three ingredients! But they are also so, so delicious. Worth every last calorie. To make these, you start by dishing up balls of cookie dough – use a medium cookie scoop for this. It makes the process totally painless. You need to place them two inches apart on the cookie sheet. These cookies spread when you bake them. Once the cookies are baked and cooled, you make the Clementine glaze. Start with the juice of one Clementine orange and some powdered sugar. Mix it up. Next, add Clementine zest to the bowl and whisk it all together until its smooth. Once that’s done, drizzle it over the cookies. Trust me. This is super easy – and tasty too! This recipe is a cinch to adapt to a gluten free version. Make or buy 14 gluten free sugar cookies. The only other ingredient to be weary of is the powdered sugar – make sure it’s gluten free (some aren’t). Once you have the cookies and the right sugar, just follow the directions for creating the glaze and glazing them. You can have your cookies and gluten free too! For another yummy gluten free cookie, try the Betty Crocker Taste Seekers Fudge Crinkles recipe, too.